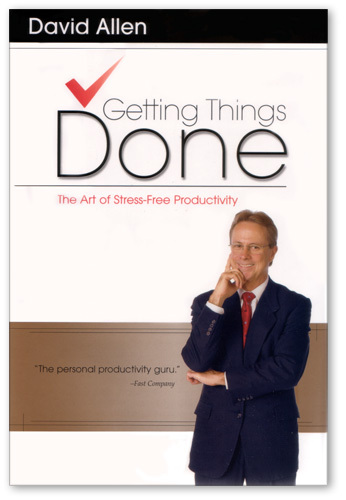 After reading so much about David Allen’s “Getting Things Done” book, I decided to give it a try. I had been listening to his podcast and had already implemented many of his great ideas in my day-to-day activities in order to be more productive. I’m naturally disorganized and yet have many things to get done (sounds familiar?). Mr. Allen presents his tested and tried method for processing your commitments and projects in a way that they are off your mind. If you implement his system, you’re guaranteed to get everything done and still be stress-free. I highly recommend it. One of the things that piqued my interest as a project manager is how he defines a project: “a desired result that requires more than one action step.” This is a very different definition than the one given by the PMBOK Guide. In short, the GTD methodology defines a project as a collection of of two or more actionable items. So, “buying milk” is not a project, but “collecting 100 ‘Got Milk?’ ads” is. In “buying milk”, all you have to do is to buy it. If you want to collect 100 ads, you’ll need to research where they were posted, buy the magazines, cut off the pages, get a scrapbook, etc. The difference is that Mr. Allen is dealing with personal projects with the sole goal of getting them done. Therefore he simplifies the definition of a project with that objective in mind. He is not “managing” projects, he is checking them off, without concern for risks, quality, cost, etc. It’s simple but it really works on a low-level, personal productivity level. I’m about halfway through the book, and will post some more once I’m done.